Home News Trending Direk Erik Matti Tweeted: 'Sa lahat nang bumoto kay [President Duterte], P*tang Ina Nyo'. Netizens burst anger to Director, "BOYCOTT All His Films!" Direk Erik Matti Tweeted: 'Sa lahat nang bumoto kay [President Duterte], P*tang Ina Nyo'. Netizens burst anger to Director, "BOYCOTT All His Films!" 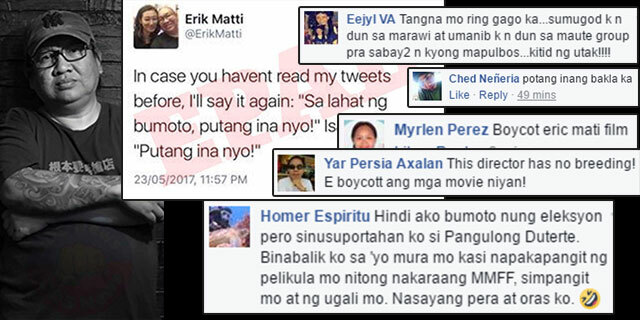 Direk Erik Matti who also regognize in his movies On the Job, Darna, Gagamboy, Magic Kingdom and etc, attacked Duterte and his supporters on Twitter once again. 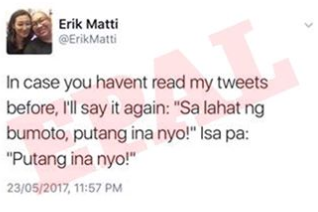 This was taken from DDS News Facebook Fan page, since Erik Matti, blocked all the users who criticize him & private all of his tweets from non followers. He tweeted an hour after President Duterte declared Martial Law in the entire Mindanao: Sa lahat nang bumoto, putang ina nyo!" Isa pa: "Putang ina nyo!" at exactly May 5, 2017, 11:57pm. Several fan pages on Facebook posted and lambaste Matti for being rude and an idiot on his tweet. And also netizens, posted their comments expressing their anger towards the director and they even threatened and asked others to boycott all of the upcoming movies of Matti. 16 million ang minura mong bumoto nakakahiya naman sayo.. Dami mong sinagasaan.